The directory viewer is a system view that enables the navigation of SIMetrix related files and directories. By default, the SIMetrix folder in your Documents directory will appear in this view when you first use SIMetrix, as shown in the figure below. The view will display the folders within the directory along with files that are associated with the program. Double clicking on a file will open it in the program. The File View. The top level directory, SIMetrix, is the initial default top level directory. Below that, all sub-directories and application related files are shown. To add a new top-level directory to the viewer, click Add Directory, then navigate to the directory to add to the view. 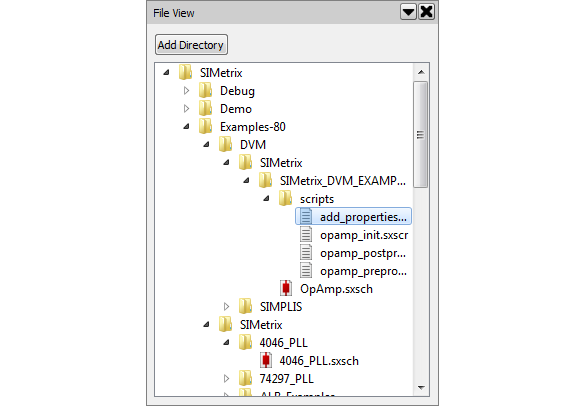 When selected, the file viewer will show all sub-directories and files that are associated with SIMetrix or SIMetrix/SIMPLIS. To remove a top-level directory, right click on the directory and press Unload Directory. The right click menu also allows you to open the containing folder for a particular sub-folder or file, create a new folder and refresh the listings (although in most cases the listing will refresh automatically).